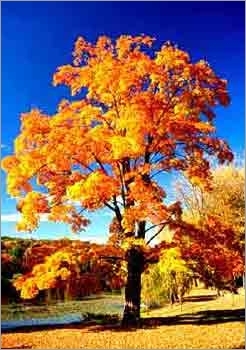 Acer saccharum, the Sugar maple, is native of Canada, mainly present in Québec. The tree grows up to 30 meters tall at a slow rate when young. Maple syrup is made from this species. The sap can be tapped within 10-15 years from seed but it does not flow so well in areas with mild Winters. The sap is tapped from the trees in early Spring, then boiled down until it is thick enough to be called syrup. It takes about 40 gallons of sap to make one gallon of syrup. With shades from yellow to scarlet to blaze orange, the sugar maple's fall foliage display is dependable to the point of becoming an important tourist attraction. It has a large, dense and rounded crown and is one of the giants of the forest. Its leaves are opposite, 3-6 inches long, with 3 to 5 lobes and deciduous. The maple leaf flies proudly on the Canadian flag. The bark is smooth and grey when young, becoming flaky when older. 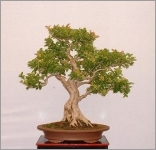 The tree bears small greenish yellow flowers in early Spring, and the seeds ripen from October to December. The flowers are hermaphrodite they have male and female organs. The fruits of the Sugar maple are called winged samaras and appear before the tree leafs out in early Spring.